Wouldn’t it be nice to wear your blue jeans to work every day? Unfortunately, many professional offices do not allow employees to wear jeans at work. However, when a company does not want jeans to be worn at work they mainly are referring to denim and its many washes. 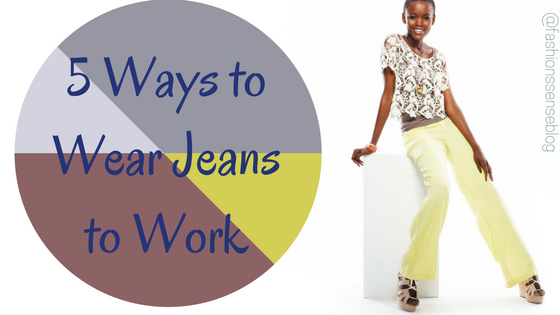 There are ways jeans can be worn to work without your bosses knowing. Learn five style tips that make jeans office-friendly. Some people consider jeans and denim to be the same thing. However, jeans are a style of pant while denim is a fabric. Jeans were originally made from denim, which is why many think of them as being the same thing. Denim fabric is mainly made in blue or black with various washes giving them a casual appearance. This is the look that most companies do not want seen in their offices. Jeans can be made from different fabrics such as satin, crepe, plain twill, linen, velvet, corduroy, and various others. Also, wearing darker and more fashion colors like brown, gray, tan, olive, purple, red, and royal blue make jeans look less like jeans. Even though these other fabrics can be used for jeans, the construction of jeans signal what type of garment it is. 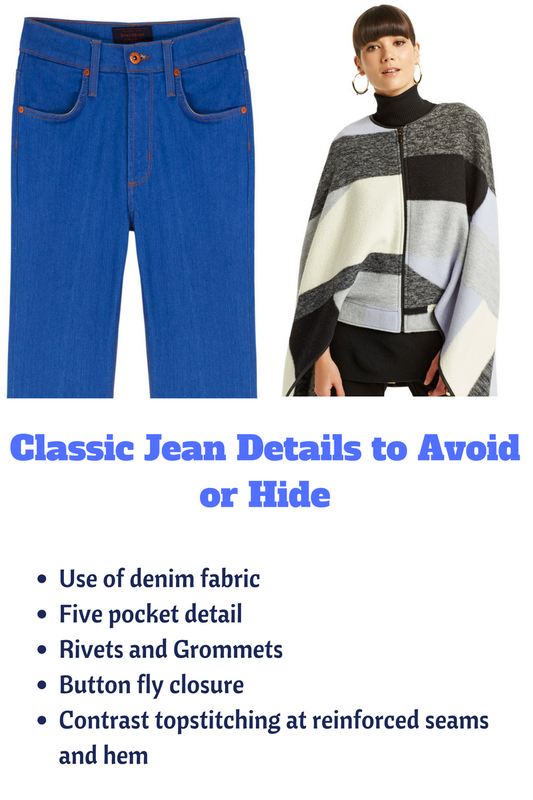 These obvious style features -- rivets, metal zippers, fifth pocket -- are what you will need to hide to make your non-denim jeans office-appropriate. One feature of standard jeans that give them away as being jeans is the fit. Skinny jeans and slim-fitting jeans look like jeans regardless of the fabric chosen. Also, at the office, body hugging jeans really should not be worn in order to maintain a professional image. Relaxed fit, wide-leg, and even flared jeans made from crepe, satin, or pinstripe fabrics fit easily into an office setting. Five-pocket jeans are pretty standard. 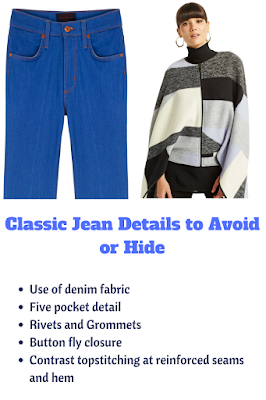 However, that fifth thumb pocket in the front is another obvious sign that you are wearing jeans. Work pants should have no more than four pockets total, two in the front or side seam and two in the back on the seat of the pants. BUT... if your jeans do have these details the next three tips will help. A suit jacket and blazer are easy ways to make jeans look office appropriate. When buttoned, these jacket styles hide the features that identify jeans. No one will see the button-fly, fifth pocket, or rivets found near the waist, pockets, and hips. A suit vest is a stylish option for the office anyway. However, a vest that falls two to three inches below the waist can hid jeans details found near the waist. The vest is an alternative to the jacket or blazer on hotter days. The easiest way to hide the tell-tale signs of jeans is to wear longer tops. There are long dress shirts, blouses, and tunics that can hide jeans details and still give you a professional appearance. Add a touch of style to a basic scoop neck tunic by wearing a wider belt at the waist over top of it on casual work days. These five ways to wear jeans at the office will give you more style options. Your bosses more than likely will not notice that you are wearing jeans. Those who do, probably will not make it an issue as long as the jeans, don't look like jeans.